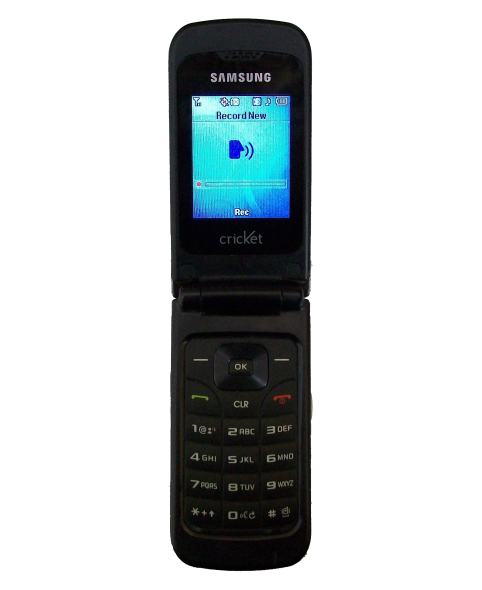 Qcp audio file format is typically used on cell phones to save new sound recordings. Transfer sound recordings from your cellphone to the My Music library on your computer, via USB cable, micro SDHC card or BlueTooth transfer. PureVoice® from QUALCOMM will automatically convert qcp files to wav (wave) format for use on other devices. You can edit wave files for use in various applications using (limited) freeware such as Wavedit and Waveflow, among others. This tutorial describes the process as run on a Windows platform, although purevoice software is also available for Mac and Linux. 1. Download the PureVoice SDK zip archive directly from Qualcomm. Create a new folder in your Windows Program directory and rename it PureVoice. 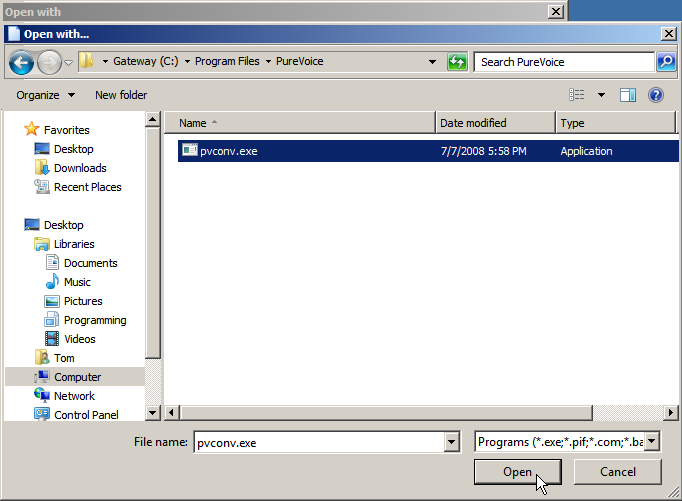 Example: C:\Program Files\PureVoice. 2. Open a separate windows explorer window. Navigate to and open the PureVoice SDK zip archive, highlight all contents (Ctrl+A) then drag and drop it into the PureVoice folder you created. 3. Associate the qcp file format. 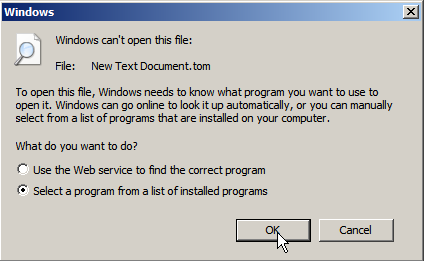 In order to open a new/unknown file format, it must first be associated with the correct program. Click on a qcp file, for the first time, to open the Open With interface. Navigate to the location of the pvconv executable in the C:\Program Files\PureVoice folder and select it. Doing so re-opens the previous window, now showing pvconv.exe as highlighted. 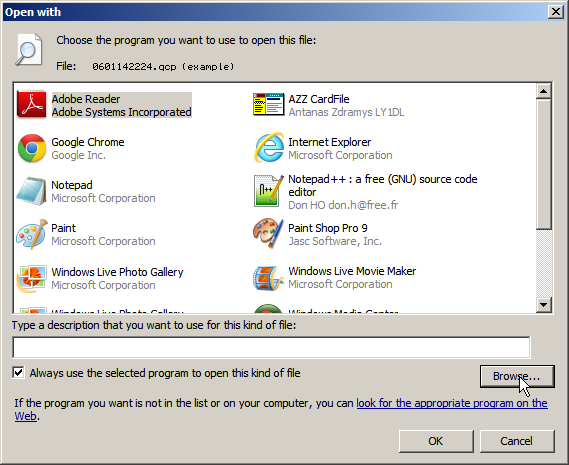 Be sure the box next to "Always use the selected program to open this kind of file"is checked, before clicking OK.
4. Navigate to your qcp file, transferred to your computer from your cellphone, and click on it. This will automatically toggle the PureVoice program to convert the file, creating a new wav file of the same name in the current folder. This new wav file can then be edited and used. The pvconv.exe is a "command-line utility" which cannot be run by simply clicking on it. * Cellphones record up to one minute of audio. * Record new sounds from the My Ringtones section of the Multimedia menu. * Many free programs, such as SMConverter, can convert wave to Mp3 and other formats.